What is the forklift stability triangle, and what training requirements do you need to satisfy OSHA legislation? Let’s take a look at what you need to know, and how CertifyMe can help you achieve compliance. Now, draw a triangle to connect these three points. As long as the forklift’s center of gravity remains somewhere in this “stability triangle,” OSHA considers this a well-balanced forklift. 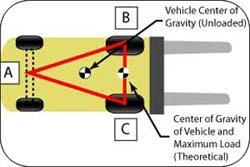 Once the load shifts outside the forklift stability triangle, the lift can tip over. This is a useful tracking system to keep tabs on your own forklift’s stability. If you’re not sure what is the stability triangle on a forklift, CertifyMe’s training modules (standard and Train a Trainer courses) will help you understand what it is – and how it relates to your day-to-day functions as a forklift operator! What is Forklift Stability Triangle Training? OSHA standard 29 CFR 1910.178 Appendix A sets the safety guideline for everything related to the forklift stability triangle, including effective training methods to help ensure all forklift operators understand this crucial safety concept. CertifyMe’s OSHA forklift safety training courses offer up-to-date training on the forklift stability triangle, and our coursework also covers other important OSHA safety standards, too. Our regular training class and Train a Trainer option provide thorough forklift stability triangle training for anyone that operators a forklift. Plus, we offer free lifetime renewals, too. Visit our contact page or call us today at 888-699-4800 to learn more about our OSHA forklift stability training. Thanks for visiting CertifyMe!